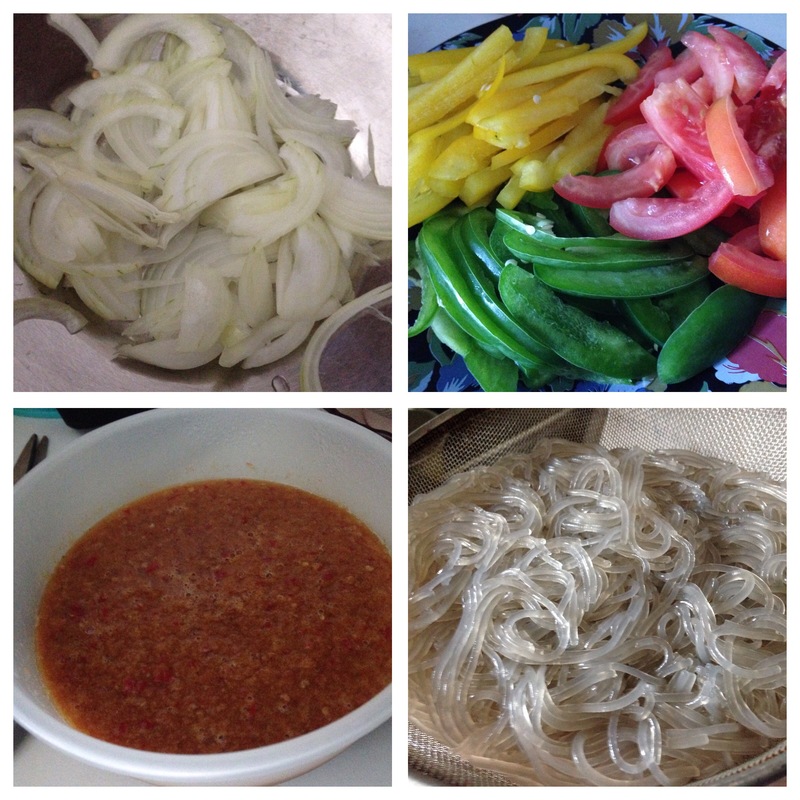 Today, I decided to try cooking the Japchae with a twist. I decided to try mixing it with Thai style sauce. Unfortunately, since this is my first time trying it out, all ingredients are based on estimation. So what I’m typing out here will be just an estimation. For those who wish to try out, you will have to do it at your own preference as well. 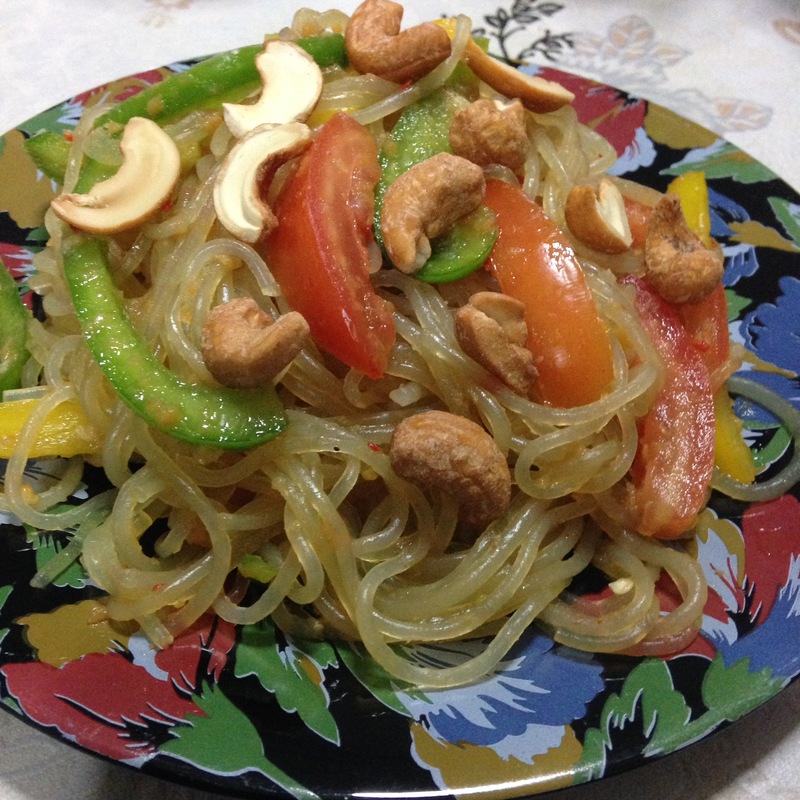 250 g of Korean glass noodles (Japchae) – Boil in hot water till soft, drain and rinse with tap water. Drain and put aside. 2-3 stalks of coriander leaves – chop. Pound the dried shrimps, garlics, chilies, coriander stalks and palm sugar. Then add the lime juice and fish sauce. Alternatively, you can add everything in a blender. Finally, add all ingredients into the big bowl. Add the glass noodles on top of the other ingredients and pour the sauce over the noodles. Note: As you mix the Japchae, adjust the taste accordingly if needed. Today, my eldest daughter is the chef of the day! Right after school just now, she went to Cold Storage and bought ingredients to cook this dish, Pesto Chicken and Veggies. 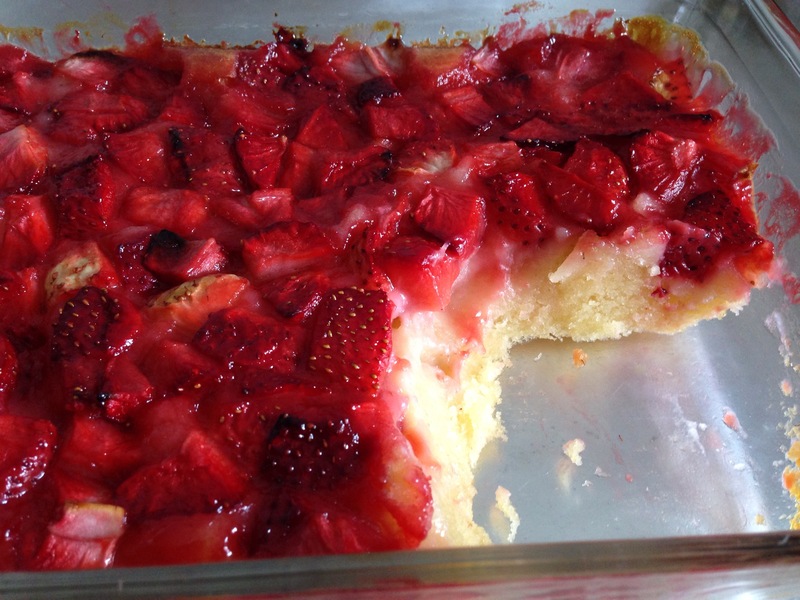 This is the dish … (she sent me a photo via watsapps just now). She could not find asparagus and so substitute it with capsicum. Looks good and according to my gal, it tasted good too! A favourite among my family, especially with my 2nd daughter! …. 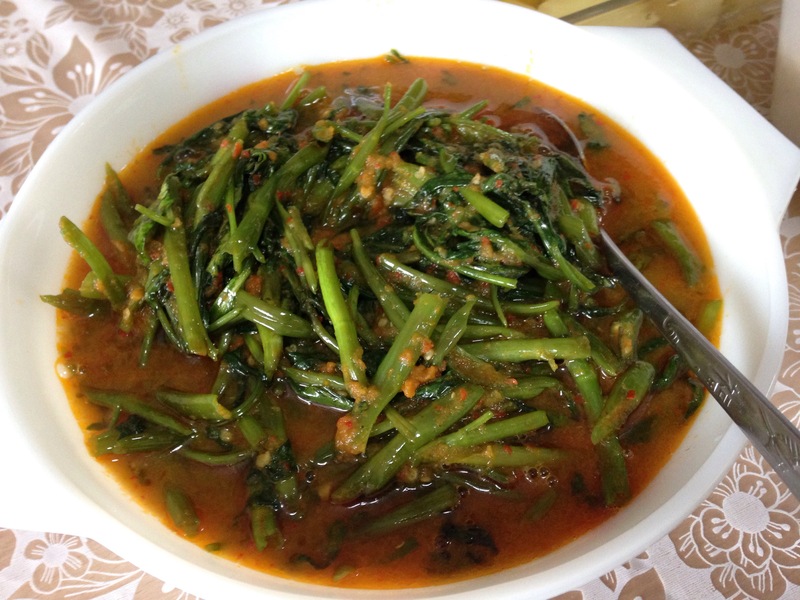 This vegetable dish is spicy yet taste sooo good. Heat a small wok and pour a little oil. Once the oil is heated, fry the blended ingredients. Fry till fragrant. Add enough salt and sugar to taste. Stir well. Then add in the Kangkong. Stir well till the vegetables are cook but do not overcook. Off the fire. Serve hot with rice and other dishes. I love pickles especially cucumber pickles and for the Malays, we called our pickles “Acar”. This recipe belongs to my late mother. Our family favourite. It’s spicy, crunchy and has sweet and sour taste to it. – Take each of the sides and slice the cucumbers lengthwise as shown in the picture below. – Put the sliced cucumbers in a drainer. – then sliced thinly and each sliced cut further into matchsticks sizes. – add to the cucumbers in the drainer. Once done, sprinkle some salt over the cucumber and carrots. Mix well and leave it to drain the juices for about 1 hour or more and throw away the juice. 10 pieces of dried chillies – soak with hot water. – Fry the blended ingredients till fragrant. 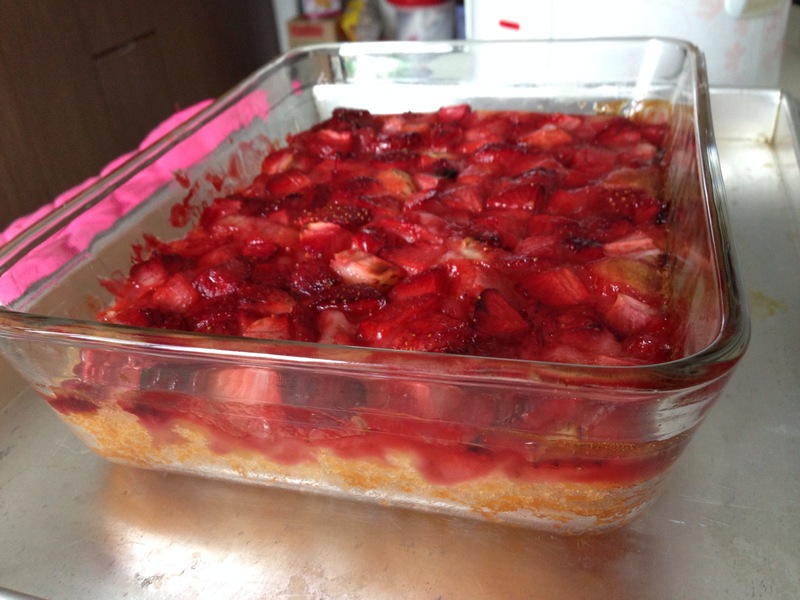 – Mix well and once the taste is right, off the fire and let the sauce cool. – Once the sauce has cool, then add the cucumbers and carrots. Mix well. It’s now ready to serve with rice and other dishes. Note: Any balance of the acar, you can keep it in the refrigerator. If you do not like the spiciness of this acar, you can still make it minus the dried chillies or reduce the chililes. I come across this health drink recipe in FB. It looks simple enough and I do love pears and cucumbers so I gave it a try. 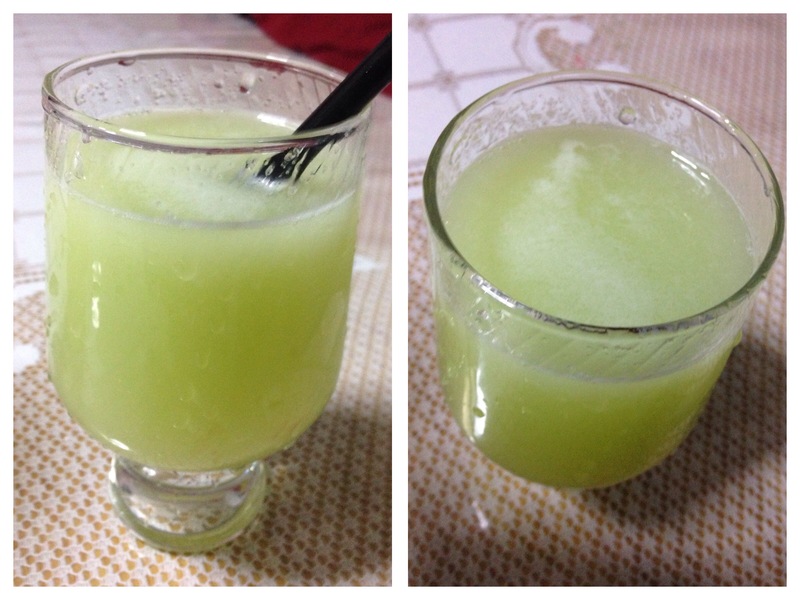 This drink is suppose to help with detoxification and burn fats in the body. Love the taste…. Even my gals like it and it does help getting rid of stomache wind and improve my bowel movement but not sure about getting rid of fats cos I have only tried it twice. Anyway, here’s the recipe for those who would like to try it. Place all the ingredients in a juicer and then blend them. Pour into a strainer and there you have it! The ginger pear drink is ready for serving. So this Opor Nangka is my first effort cooking it by myself. Alhamdulillah, it turns out ok … phew!!!! I was kind of apprehensive cos I have this feeling it might not be good but as I said, Alhamdulillah, its taste good but not as good as my late mum’s of course. 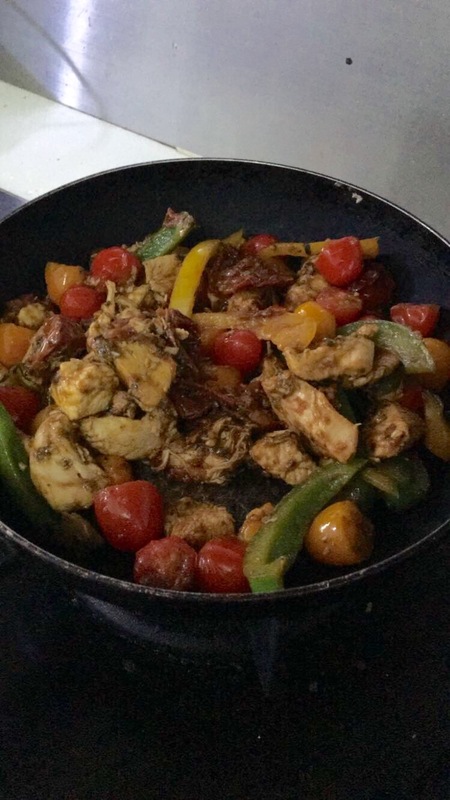 – In a pot, add a bit of oil and fry the blended ingredients, fry till fragrant, add the kaffir lime leaves, the ground assorted spices and water (not too much just enough to cover the jackfruit, can always add more if needed later). 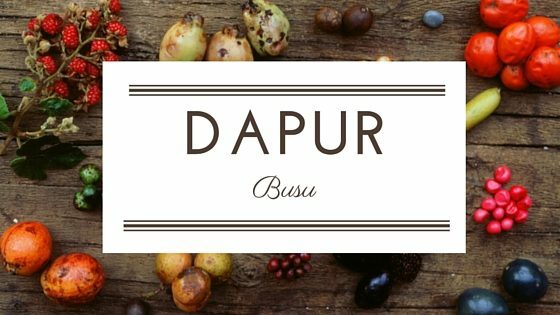 – Add in the jackfruits, and the kerisik. Stir well. – Once the gravy has boiled, add the tamarind juice and coconut milk. – Add sugar and salt to taste. Stir often and let it boil till gravy thickens a bit. Off the fire. Not feeling too well today, in fact I’m on 1 day MC. Still has to eat right! So I decided to make a quick and simple dinner. First is the Pineapple Mango Salsa or more known as Pineapple Mango Salad. Pineapple Mango Salsa … so refreshing! 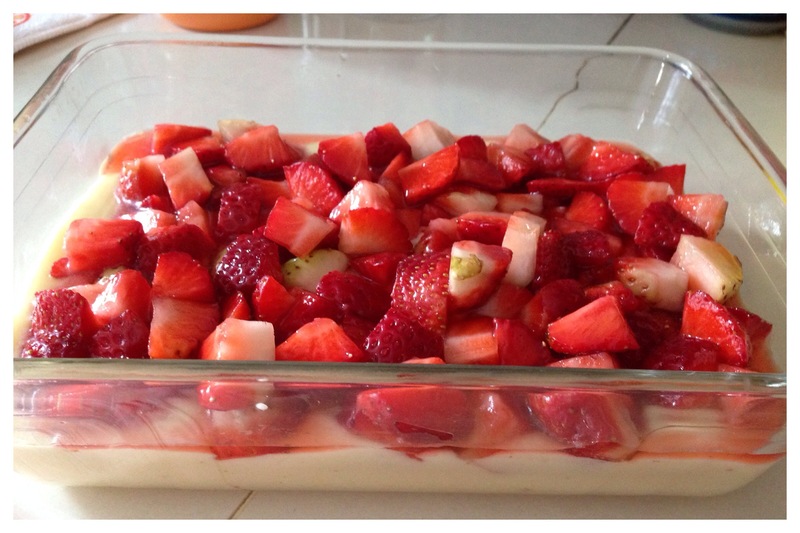 Within 10 minutes its all ready and now its chilling it the fridge while waiting to be served with the main dish. Combine all the ingredients together in a bowl and mix well. Cover and chill in the fridge till its ready to be use. (recipe origin from Divas Can Cook, but I tweak it a bit by using red chilli instead of jalapeno and I add sugar a bit). 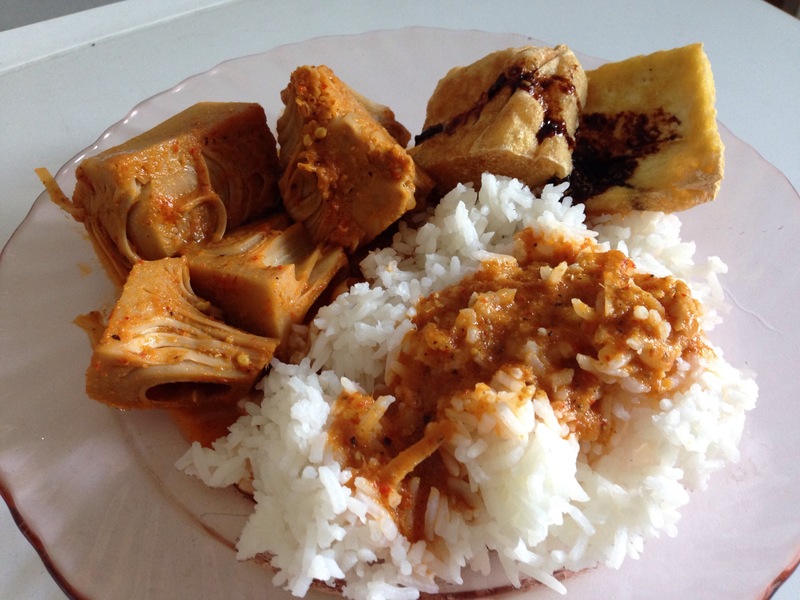 Another version of a dish from Java. The usual Sambal Goreng would use coconut milk and so the colour would be reddish (due to the grounded spices and chillies) but this time round, I tried my hand at this new version … well to me it’s a new version because I have never ate it before nor cook it and even heard of it till a friend introduced it to me few years ago. The colour is dark thanks to the black soya sauce. This is much simpler to cook and taste great too. My eldest daughter simply love this dish as do I. To make the dish look attractive, you can always add slices of red chilies but I chose not to this time round. Onions, shallots, fresh tumeric (can also use powdered ones), ginger, galangal and birds-eye chillies. Fried the blended ingredients till fragrant together with the lemongrass. Leave it to simmer for about 5-10 mins. Finally, sprinkle some white pepper and stir well. Note : There’s no need to add salt or sugar because the sweet black soya sauce makes the taste sufficient without them. Though of course different people different tastebud so if you want can always add a bit.